Forestry Expo Scotland offers unique sponsorship opportunities guaranteeing high brand visibility and reach within the sector. The event represents an affordable way to engage with an estimated audience of 5,000 visitors and an association with a prestigious, new, exciting and innovative event. We have packages to suit all budgets and will be happy to create bespoke packages to suit individual requirements. The following packages provide on-site publicity but they also deliver wider benefits associated with the marketing campaign supporting the event before, during and after the actual open days. Sponsorship support will be recognised and acknowledged in the official show catalogue and guide published by Forestry Journal magazine. If you wish to discuss any of the options listed below including costs associated or have your own ideas for potential collaboration then please don’t hesitate to contact the Forestry Expo team. Join our exclusive group of Forestry Expo Scotland 2019 headline sponsors. Your company logo will be included on all promotional material for the event and displayed on Forestry Expo web based platforms. Speak to the team to obtain ore information. entrance to the marquee. The visitor layout plan will also include the sponsor’s logo. This package will include the company logo to be placed on various pages of the Forestry Expo website. All social media posts promoting the Trade Stand Marquee will reference the sponsor. This package provides brand exposure from the moment the visitor engages and then commits to the event. The Online event ticket booking page and the bar coded ticket will feature your company logo. The registration desks, the registration marquee and the approaches to the registration point will all be included in the branding opportunities available. There is additional scope to have staff working on the registration desk wear the sponsor’s branded merchandise. The shuttle bus service is provided to visitors free of charge. By sponsoring the shuttle buses to and from the harvesting demonstration to the trade stand area the sponsors branding will be placed on each bus as well as there being the opportunity to have flags or banners located at both pick-up and drop-off points. The shuttle bus sponsor will feature on the Forestry Expo sponsorship and visitor information web pages. The package will be developed between the organising team, the bus operator and the sponsor. Event car parking is provided free to visitors. Sponsoring the car park enables your company to brand the perimeter and entrances to the car parking area with banners and or flags. The sponsor will feature on the sponsorship web page and wherever car park information is detailed e.g. on the website visitor information pages. Company literature can also be offered to visitors as they enter and leave the car park. The Food Court is situated at a central point on the event site. This area will provide a space for visitors to relax, eat and take refreshments in between visiting trade stands and experiencing the demonstration programme. 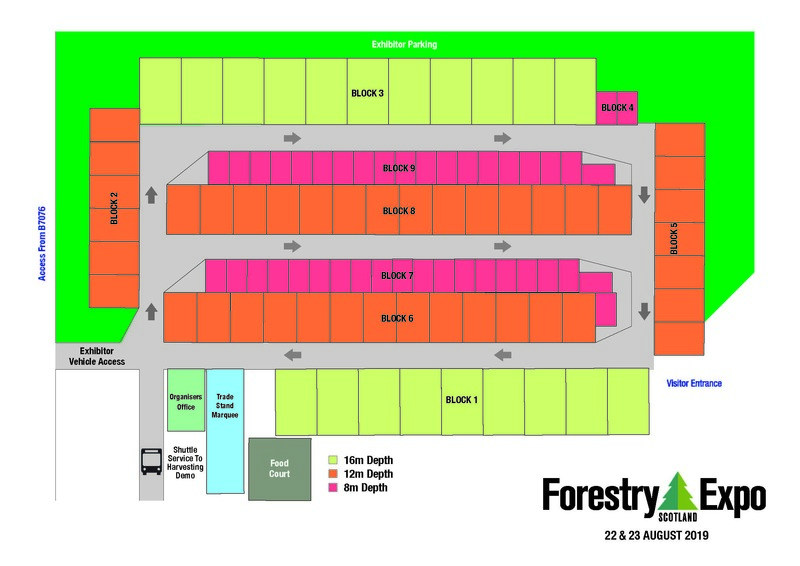 Forestry Expo is offering a sponsor the opportunity to brand the food court marquee with banners and flags. The sponsor’s logo will feature on the event plan, in the event catalogue and on the Forestry Expo website as well as in social media posts promoting what visitors can expect from the event. The organiser will work with the sponsor and the event caterer to deliver the associated sponsorship benefits. Forestry Expo Scotland is seeking a sponsor to provide branded workwear for the on site delivery team. Branded hi-viz clothing provided by a sponsor creates visibility and places the company brand in front of visitors at multiple points and times over the two days of the event. Forestry Expo Scotland is a focused trade event promoted to forestry professionals. The demonstration programme is anticipated to attract an enthusiastic and dedicated UK and international audience. It is anticipated that Forestry Expo Scotland will generate significant industry interest and media coverage.